Without a doubt the next ‘must visit’ destination on your golf break wish list should be Antalya on the Mediterranean Coast in South-Western Turkey. This golfing paradise is a gem along the Turkish Riviera. A golfers paradise, it boasts many luxurious hotels and fantastic golf courses. These are all located in close proximity to one another meaning transfer times are kept to a minimum. Golfbreaks.ie have just returned from this great destination and were hugely impressed. Turkish airlines provide a great service from Dublin to Antalya. They also allow free transportation of a 30kg luggage bag and your golf clubs in addition to this. You fly from Dublin to Istanbul and then get a short connecting flight from Istanbul to Antalya. On arrival the majority of the golf resorts are only 40kms from the airport. Let the enjoyment, relaxation and awe begin. The Golf Resorts provide a first class service that will leave you truly satisfied with your decision to travel to Antalya. Every element has been thought of and planned for to ensure you get the maximum enjoyment out of your stay. Dining in the hotels is a pleasure with excellent service and quality of food obvious from start to finish, the packages we recommend are on All Inclusive Basis (food and drink, yes folks alcohol is included!) so all your meals are included. You simply cannot fault the Golf Resorts in Antalya they do everything fantastically and have great pride in the offering and the region. There are some great options for you to choose from depending on your preference, if you are a golfing group or a family looking for a nice break Antalya has it all. Whichever hotel you choose from the various options we provide we are more than confident you will thoroughly enjoy it. These are hotels such as the Sueno, the Sirene, the Cornelia, the Kaya, the Gloria, the Kempinksi, the Voyage, the Maxx Royal and the Carya Regnum. These all offer a slightly different atmosphere and we can advise to suit your needs, the common theme will be quality. 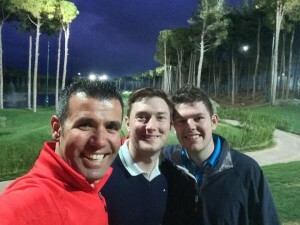 * Picture Above – Golfbreaks.ie enjoying floodlight night golf at Carya Golf Course!!! With over a dozen golf courses to choose from, all of which are manicured to the highest levels, you will not get bored playing golf in Antalya. There is a fantastic mix of championship golf courses such as Carya, PGA Sultan, National, Faldo, Sueno Pines and the Montgomerie Course (home to the Turkish Airlines Open) to name a few. There are also many other top quality courses such as the Pasha GC, Kaya Eagles, Sueno Dunes, Tat and the Gloria Courses. One of the most interesting and unique elements is at Carya Golf Course where the back nine holes is floodlight and a joy to play. We enjoyed 9 holes one evening under these floodlights and had a great time. All of the golf courses again offer a common theme of quality, you simply will not find a bad course in the area. Some of the above courses are more difficult than others, but all are good golf courses, another reason to add this great resort on the Turkish Riviera to your ‘must visit’ list. This golf destination is only going to grow and become more and more popular due to the quality of the offering along with the beautiful sun soaked climate. Golfbreaks.ie would highly recommend this golfing paradise. Contact us today to discuss things further.